As a leading global automaker, pioneering the development of the automobile industry in Korea, Hyundai seeks to achieve win-win growth with its suppliers Tweet This!, as it believes that their competitiveness provides the basis for Hyundai’s own competitiveness. Promoting the sustainability of its supply chain is, thus, a key priority. This case study is based on the 2017 Sustainability Report by Hyundai published on the Global Reporting Initiative Sustainability Disclosure Database that can be found at this link. Through all case studies we aim to demonstrate what CSR/ sustainability reporting done responsibly means. Essentially, it means: a) identifying a company’s most important impacts on the environment, economy and society, and b) measuring, managing and changing. In its 2017 Sustainability Report Hyundai identified a range of material issues, such as product and service quality, improving financial stability, labour-management relations, ethics/compliance management, developing eco-friendly products. Among these, promoting effective environmental, health and safety management among its suppliers stands out as a key material issue for Hyundai. 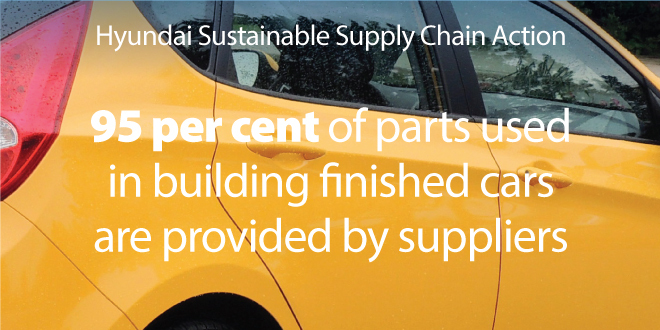 What actions were taken by Hyundai to promote effective environmental, health and safety management among its suppliers? Hyundai recommends its suppliers to achieve the OHSAS (Occupational Health and Safety Management System) 18001 certification to prevent or manage risks related to production operations, and apply a voluntary safety and health management system. Additionally, Hyundai encourages suppliers to achieve ISO (International Organization for Standardization) 22301 certification, so as to respond to accidents and disasters in a systematic way, and, also, to nominate a disaster management officer. Hyundai’s Ulsan Plant implements an education support program for tier 1 suppliers in the Youngnam region regarding the environment, safety and health. In 2016, 57 people from 47 companies voluntarily participated in the program. The program provided information on, among others, how to respond to safety accidents, on-site accident investigation techniques, and chemicals management at Hyundai. In addition, the Asan Plant offers its suppliers technical support in the environment, health and safety areas. In 2016, it also provided technical guidance to 20 external suppliers on regulatory issues, facility management, legal compliance and chemicals management. Hyundai has been implementing, since 2012, the ‘Energy-Saving Technology Exchange Meeting’. This program helps suppliers better manage energy use, grow sustainably and become self-reliant. In 2016, 33 suppliers participated in the program. They shared their energy-saving success stories and related technological information. Note to Hyundai: With each case study we send out an email requesting a comment on this case study. If you have not received such an email please contact us.